How often, when receiving flowers as a gift, we think in which vase they will look better? How often, when buying a vase, do we think about how much it will fit into our interior? Probably, one of the universal varieties of vases is a vase made of transparent glass. The shape and size of it can be different, but the very fact of transparency and lightness makes it ideal for colors of any sorts and shades. Flowers in such a vase will always look stylish and beautiful. And if you decorate the bottom of the vase with artificial flowers, berries, small fruits, stones or balls, this will make a real work from a vase with flowers. 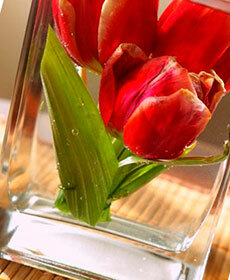 If desired, you can add food coloring to water - this will make the vase a bright accent of the room. Of course, all this should be kept in perfect purity, change the water daily and carefully wash the vase, plant stems and decor elements. Ordering a bouquet through the flower delivery service in Kiev, you will get the opportunity to enjoy its beauty and freshness for a long time. Do not forget to release the bouquet from the wrapper, and the stems of the flowers from the lower leaves. 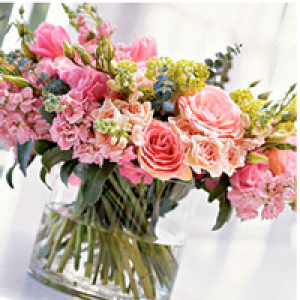 In the free from the presence of bouquets, a transparent vase can become a good decor of the interior. In such vases you can lay out coffee beans, sea pebbles and shells, acorns, colorful beans and nuts, beads and dried ears. In addition, low vases can be used as a candlestick. From the wide round or rectangular vases you can make a night lamp, putting in it a small New Year's garland. The vase from the outside can also be decorated with ribbons, lace, beads, strips of bright paper - everything that comes to your mind and will correspond to the mood or holiday. One of the options for a beautiful and original flower gift for absolutely any person of any gender will be a bright composition of flowers in a vacuum. Three hares are killed at once: a colorful composition of flowers, a glass transparent vase and no need to take care of the safety of freshness of flowers for 4-5 years. Particularly happy with this gift will be obvious allergies, lovers of tobacco smoking and pets, and those who completely forget to care for flowers. Be sure, your flower gift will not be left without attention on any celebratory event. In addition, flowers in vacuum vessels can serve as an excellent decor element for any interior, you just need to choose the right flowers for the composition. Such "bouquets" are not afraid of drafts or frosts. They do not need sunlight and watering - bright sun rays and high humidity are even harmful. Why do colors and freshness of flowers last so long? The principle of embalming is used. The natural juice of plants is replaced with a solution based on glycerin. In order for flowers to be captivated with bright colors, they are torn off just at the peak of opening the buds, choosing at the same time only the best and healthy specimens, without a single spot and damage. The vessel in which the composition will be placed is carefully processed from the inside to achieve absolute transparency and to avoid the possibility of germs entering the plants. After the flower arrangement has been completely placed in the flask, the flask is sealed and all air is pumped out of it. The absence of air and glass make the optically more vivid and large flowers. True, you can not touch them and enjoy the smell. Choose you what is more important - the scent of fresh flowers in your home or their perennial unfading beauty.